We are delighted to offer the brilliant Corner Sofa Bed-london Beige - Fabric-extra Soft- Elastic-quality Silicone Foam. With so many on offer recently, it is good to have a name you can recognise. 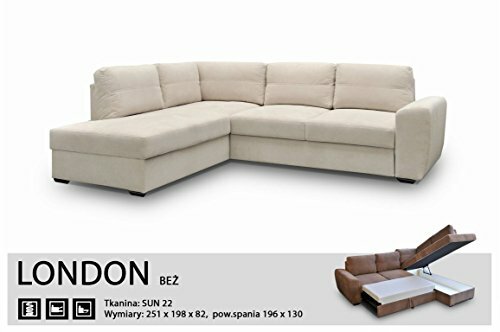 The Corner Sofa Bed-london Beige - Fabric-extra Soft- Elastic-quality Silicone Foam is certainly that and will be a great buy. For this great price, the Corner Sofa Bed-london Beige - Fabric-extra Soft- Elastic-quality Silicone Foam is highly respected and is always a regular choice amongst lots of people. Megan Furniture have included some great touches and this means good value for money. Length: 251cm Height: 82cm Depth: 198cm Bed width: 120cm Bed length: 196cm Style: Modern Material: Solid Wood, MDF/Chipboard, Fabric/ Faux Leather Additional details: Sinuous Spring, The storage space under the seat. Bundle measurements:86/ 23/55 135/85/80 195/80/80. Tools and instructions are delivered together with a couch. Our delivery service in London area and up to 100 miles from London - costs ~ ? 65. The motorist will require help. We provide to the ground flooring. If it is not on the ground flooring, we charge additional charge of ? 5-? 10. Our premium delivery service is a two males delivery and we need that you add ? 25 additional charge for this delivery option, if there is no second individual to assist our motorist carry the sofa. If your drop off address is further than 100 miles from London, please call us and check our delivery cost before buying our item. We need that you confirm via e-mail your telephone number just after acquiring our item!!!. The modern style corner sofa bed with a hidden storage space A brand-new,unused,unopened and undamaged in original retail packaging Luxury sofa bed for everyday use - Very good value for money We don't deliver to North Ireland, Scottish Highlands and Islands Once you buy it, please confirm your telephone no. via email otherwise we will not be able to arrange delivery!